The real presence of Jesus is fundamental to the understanding of the Eucharist in the Catholic tradition. Christ is present in the faithful gathered in His name, in the Word as the Scriptures are read and explained, in the person of the minister, and in a unique way under the species of the Eucharist. Eucharist is also the sacrament of the Church’s unity. In Eucharist, the Church becomes most fully itself. It is visible in the assembly which listens to God’s word, breaks bread, and shares the cup until He comes. In Eucharist we celebrate our life together as a community, the presence of Christ in our midst, the Word that is proclaimed and explained, and the paschal mystery of life, death and resurrection. 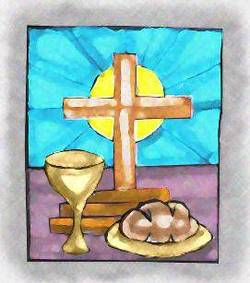 We celebrate our unity with Christ in communion and service. Eucharist in not an isolated event in the individual’s life. It is a step in the process of growth in life. The active presence of Christ demands change and conversion in graced stages where God touches us in special ways. Eucharist is the heart of Christian life. At St. John the Baptist Parish, preparation for First Eucharist is most often begun with children in the third grade.